Kauai (aka “the green island”) lives up to its name with lush hiking trails — many with film-worthy waterfalls — and breathtaking vistas. Unlike on built-up sister islands Oahu and Maui, only 3 percent of Kauai is developed, and you’ll notice that life moves slowly — cars wait as roosters cross the street, and pause when passengers admire the rainbows that often span the sky above. Just be mindful of the time here: Only one ship, Norwegian Cruise Line’s Pride of America, is allowed to stay longer than 24 hours. All other ships dock at sunrise and ask passengers to be back onboard around 3 or 4 pm. Tip: Don’t be scared off by the fact that Lihue, the island’s port city, has few things to see — the rest of the island deserves a closer look. 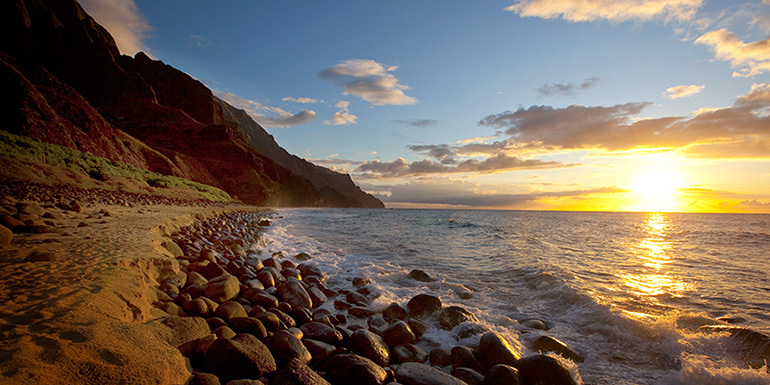 Rent a car and drive south to get to the resort areas of Poipu and Waimea, or north for Princeville and Hanalei Bay. Lunch: Hamura’s Saimin Stand – You should not leave Hawaii without slurping a piping hot bowl of saimin, a noodle dish developed on the islands that will undoubtedly rival the best ramen you’ve ever tasted. 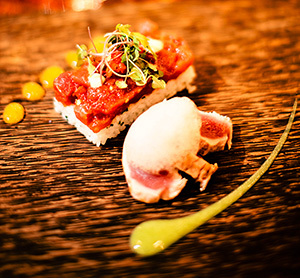 On Kauai, Hamura’s is the spot, and it’s conveniently located in Lihue, just a few miles from dock. The place is unassuming, with family-style long tables and fans overhead. Don’t be deterred by a crowd — people eat quickly and, even if there are no seats when you arrive, you should be able to get a spot before long. Dinner: Josselin’s Tapas Bar & Grill – This place serves up some of the most comforting fare on the island. Rich dishes — including duck wontons, kabocha pumpkin ravioli, and braised short ribs — are designed for sharing, and the sangria is to die for. Dessert: Lappert’s Hawaii – Kauai’s temperatures can hover near the high 80s almost year-round, so cool off with a trip to Lappert’s ice cream shop. There are four on the island, all manned with super friendly staff. The best flavors: Kauai Pie (Kona coffee, chocolate fudge, macadamia nuts, coconut flakes, and vanilla cake) and Heavenly Hana (chocolate ice cream with white chocolate-covered macadamia nuts, almonds, marshmallow swirls, and chocolate chunks). For everyone: Safari Helicopters – Kauai is a difficult island to see in just one day (some hikes and boat trips can take hours), so helicopter tours offer the best way to see the tropical landscape. 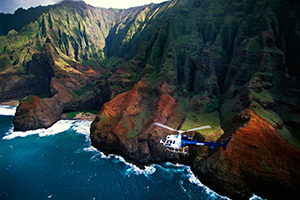 Safari Helicopters will take you and your family along the Na Pali Coast (remember the opening credits of “Jurassic Park”?) into dramatic Waimea Canyon and through Waialeale Crater. For couples: Fern Grotto tour – This flora and fauna excursion starts a few miles north of the cruise port in the Wailua River Valley. Visitors ride in a rowboat down the river while a guide sings local songs and tells tales about the region’s cultural history. After the boat ride, everyone gets out and takes a short hike to the Fern Grotto. Expect to gasp when you get there — ferns grow upside down, and colorful, tropical plants cover every square inch of the place. For families: Na ‘Āina Kai Botanical Gardens – Sitting on 240 acres in the northeast corner of the island, the gardens are open Tuesday through Friday and accessible by appointment-only tours. Families with children under 13 years old should take the “Under the Rainbow” tour, where kids can walk through a hedge maze, visit the Children’s Garden, feed Koi in a lagoon, and ride on a teak wagon. For the adventurous: Koloa Zipline – One of the newest ziplining companies on the island, Koloa Zipline is getting a lot of buzz for its jungle tours. Each starts with a “ground school” to teach participants the proper way to hold the line and control zipping gear. Then it’s time to soar over tree lines and even across the Waita Reservoir. Tip: Look at your watch before you start a hike. Many of the most beautiful treks in Kauai (i.e., Waimea Canyon) can take eight hours or more. You don’t want to miss the ship, so opt for shorter jaunts. Kauai has lovely beaches, but the island is also known for serious rip currents and deceivingly large waves. The risk is high, so don’t swim unless a lifeguard is present. What do you like to do in Kauai?